Okay, so that's a bit premature. And, judging from my to-do list and all the items still needing to be crossed off, if it were actually coming anytime soon I would be failing all of my classes and be woefully unprepared for a zillion other things, including the baby that is set to make an appearance just after the first of the year. That said, it is coming eventually, of course, and there are a few things we need to do before that glorious season arrives, well, long before it arrives or we will likely not get them done at all. As you may recall from last year, my Mom likes a particular kind of gift for Christmas, one that takes forethought and planning. So, this year we are actually making a plan in the hopes of producing just exactly what she intended when she made this request in the first place. My goal this year, however, is to include the whole family so that this becomes a tradition, an expectation, and a joy we can share together -- not just something the adults do and force the kids to participate in. 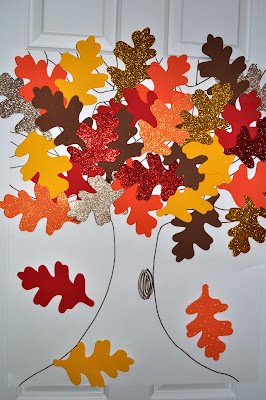 Somewhere in the blogosphere, or maybe it was Pinterest, I stumbled upon the idea of a service tree. I saw several variations on this theme and borrowed elements from a few to match our particular needs and abilities. Using an ordinary piece of poster board, I drew a tree. An artist I am not, but a tree is within the realm of my non-existent talent. To save time, I bought pre-cut foam leaves from the craft store in lieu of sitting down and tracing and cutting for hours and hours. I thought I would just tape the leaves to the tree, but it turns out that tape and foam don't bond very well, so I opted for sticky velcro, which, if I do say so myself, was genius and makes the tree reusable, if one desired as much. On the back of each leaf I wrote an act of service. Some are very simple like, "help Mommy make dinner" or "help Daddy take out the garbage." Others are bit more involved such as "make and deliver baked goods to a neighbor" or "walk in the Help the Homeless Walk-a-thon." Ultimately, however, all are very doable and can involve all 4 of us each time. We introduced the tree last night at Family Home Evening and explained that just like real trees, this tree should lose all of its leaves in time for winter too, but only if we perform the act of service written on the back. Isaac chose first and so over the next few days we will each be doing "something nice for Isaac." When that act is completed, it will be Caleb's turn to choose and so on until we are left with a bare tree and that warm fuzzy feeling you get when you do something nice for someone else. The boys seem very excited, I am too, but there are a lot of leaves between us and bare branches -- we'll see how it goes. Love it--I totally need to do this! Great idea. great way to prepare for the Christmas season even if it's not a gift for your mom. will my kids be confused that no leaves are falling off the trees outside in Arizona?? Oh well! That is super cute! I love that idea! i am always on the lookout for good family traditions! i think this is fantastic!